Paralegal Job Description: What is a Paralegal? Do you dream of becoming a lawyer but weren’t quite able to make it to the bar exam? Law is a popular field for many career hopefuls. But there is a lot of work, money, and time involved on the path to becoming a licensed attorney. Many people don’t have the resources to become lawyers or they don’t want to wait so long to get their career started. Luckily there are other options for those interested in law. You can have the best of both worlds by becoming a paralegal. Paralegals receive much of the work delegated by lawyers, some of them performing many of the same tasks. Duties that are particularly important include assisting lawyers with preparation for trials, hearings, closings, and corporate meetings. A paralegal gathers and analyzes research data, investigates the laws and facts of previous cases, and researches relevant sources in order to prepare cases. In addition, this individual assists with preparation of legal documents, correspondence, and arguments. Paralegals, also referred to as legal assistants, are not licensed attorneys but they help lawyers with their work. The most important duties of a paralegal involve helping the lawyer prepare for meetings and appearances in court. There are many details and tasks involved with trials, cases, and legal proceedings and most lawyers need help accomplishing these things in time for their scheduled appearances. As a paralegal, you have the opportunity to participate in the legal field without actually becoming a lawyer. For example, paralegals working for a litigation attorney may actually have the chance to be in the courtroom during trial proceedings. Not to mention, paralegals are invaluable members of the legal field. They allow attorneys to do their jobs more efficiently so that they can better serve their clients. Also, paralegals benefit from consistent growth in the industry as well as great salary opportunities. Thousands of lawyers pass the bar exam every year. With lawyers constantly entering the field, there will always be a need for more legal assistants. These days, job security is something that everyone values. A career as a paralegal also promises tremendous growth opportunities. Because there are so many different options for paralegals, it’s easy to stay within the same line of work while changing your daily environment and tasks. For example, you might start out working in one legal field, such as real estate, and later move to a personal injury lawyer if it interests you more. Some areas of law practice bring greater earning potential for paralegals as well as the lawyers practising in that field. Your opportunities as a paralegal will grow over time. The most experienced, trained, and capable paralegals usually earn significantly more money and enjoy a better selection of available positions. Paralegals with years of experience and training are in high demand. Also, paralegals with experience in a specific niche, such a real estate or corporate law, are highly sought by employers in that field. As you grow and learn throughout your career, you can command a better salary and the best positions. Starting out, you might earn less than your ultimate goal. But you can feel confident that your earning potential will increase substantially over time. In addition to these more difficult tasks, paralegals may be asked to perform administrative responsibilities as well, including answering phones, coordinating events for firm employees, scheduling and arranging travel, writing correspondence, and tracking and organizing files. While paralegals are strictly prohibited from performing tasks that require a legal license, such as offering legal advice or setting legal fees, they are intimately involved in all the areas in which their employment practices law. Most paralegals work 40 hours a week as well as a typical 9-5 schedule. You will also most likely work in a traditional office environment. The details of your work environment can change based on where you live and what kind of lawyer employs you. For example, your work environment, schedule and your salary may be different if you work for a private law firm as opposed to a government lawyer. The best part about a career as a paralegal is how easy it is to get started. Unlike lawyers, paralegals can get the education and training they need in just a few short years. Associate’s degrees in paralegal studies from the local community or online colleges. Some may have Bachelor’s degrees and a paralegal certification. In order to land your ideal job and a lucrative salary, it’s important to take your paralegal education seriously. Once you’ve completed your paralegal studies training, build your skills through continuing education or by getting certified by one of several paralegal organizations. Then, begin building your resume and work record by securing a paralegal position. In time, you can have an exciting career and a very comfortable income. Things are changing in the paralegal field. Typically, job availability for legal assistants fluctuates with the economy. When jobs in general become scarce, paralegal positions tend to become scarce as well. However, there are still possibilities and opportunities on the horizon. The public demonstrates a growing need for legal services. With that, thousands of new lawyers enter the field every year. With increasing need and an ever-expanding number of attorneys, the demand for legal assistants will always be present. Also, more attorneys realize that they actually save money by employing a legal assistant. The free time they gain allows them to gather more clients and perform tasks that only they are qualified to do. Even though the industry fluctuates at times, a career as a paralegal is a solid one. As with any career, income opportunities for paralegals vary greatly depending on your geographic location, experience, and education. You will find that income levels increase in regions where the cost of living is significantly higher. Paralegals working in rural or suburban areas may earn less than those working in urban areas. Your salary will also be determined by your experience and education levels. An entry-level legal assistant will earn less than an experienced paralegal. In fact, rookie paralegals might earn as little as $25,000 annually. While a very experienced paralegal might earn as much as $100,000 annually. However, you can improve your earning potential with experience, training, and by choosing more lucrative employment opportunities with private firms and government lawyers. As with any career path, more education and training is always better. The most experienced and trained applicants tend to get the best positions and in order to have options throughout your paralegal career, you want to build your skills through paralegal education. There are a few different paths to a paralegal education. Some employers are willing to train professionals in the particulars of a paralegal position. But most employers will expect you to have an Associate’s degree in paralegal studies as well as experience in paralegal positions unless you have a four-year degree from a university. If you already have a college degree, you may be able to secure a paralegal certification in place of an Associate’s or Bachelor’s degree in paralegal studies. For the most part, employers will want to see that you have the appropriate training (Associate’s degree) as well as experience. If you do not have paralegal experience, you will want to pursue the best education options available to you. Once you complete your paralegal studies degree, consider obtaining paralegal certification. Certifications require an exam and exemplify that you have certain skills that are valued in a legal assistant. If you already have a college degree and professional experience, you may not need to pursue paralegal training courses. Rather, you may be able to secure paralegal certification to establish that you have the skills and experience necessary to be a successful paralegal. However, most paralegal employers expect prior experience in the field. Without prior experience, you may need formal paralegal education to compete with other applicants in spite of your previous work record. Certifications are not required to work as a paralegal. Most employers do not expect you to pursue the various certification processes. However, this is just another step you can take to increase your marketability as a legal assistant and demonstrate your commitment to your career. In the United States alone, there are hundreds of different paralegal training schools. Once you decide to pursue a career as a legal assistant, you have to choose the best paralegal training. As you search for the right school, there are a few things you should keep in mind. First, consider your schedule and available time to complete your training to be a paralegal. Many paralegal education programs are available online and at local community colleges. Because so many paralegal trainees already have full-time jobs, you should be able to find a program that offers night and weekend paralegal courses. To become a paralegal, you only need an Associate’s degree in paralegal studies, which is typically a two-year program. Some schools may offer a Bachelor’s degree in paralegal studies, which would require four years. More training is always a good idea, however, you may be better served by using those extra two years to gain work experience if you don’t already have it. With patience and commitment, you can have an exciting and profitable career in the paralegal field. Salaries for the paralegal profession are all across the board. They range from very high to very low depending on where you live and the industry in which you work. One of the best ways to ensure you receive a high legal assistant salary that’s appropriate for your hard work is to choose an industry that pays its paralegals well. Research and due diligence are the keys to maximizing your paralegal income. Aiming for a high-paying industry will be worth your while. For example, information services are the highest paying industry in the paralegal field. Paralegals in this industry earn an average annual income of $70,320, which is an excellent salary by almost anyone’s standards. Those working for software publishers aren’t far behind in terms of average annual earnings with salaries at $69,950. Telecommunications is another very high paying industry in this field. Paralegals in communications earn $68,680 on average. In manufacturing, many paralegals earn an average annual income of $66,120. Wired communications are the fifth highest paying industry, with annual paralegal salaries averaging $62,880. Focusing on high paying industries in your paralegal career is a great way to maximize your income without being forced to relocate. If you work in the right industry, you may be able to earn a high income even if you live in a community that does not typically bring substantial salaries for professionals. Careful planning can help you make the most of a great career as a paralegal. There are many different industries in which a paralegal can work. You might think that life as a paralegal means doing the same things year after year. In fact, you can add some variety to your career as a paralegal by working in the many different industries in the field. You can also give your income a little boost along the way. But when you choose an industry for your paralegal career, it’s important to do your homework. After all, some industries promise better paralegal salaries than others. You will also find higher employment levels in some industries, which means you have a better chance of finding a position in that industry. For example, paralegals working in the federal executive branch industry earn $60,340 annually on average. This industry also happens to be one among those with the highest employment levels in the entire paralegal field. Paralegals working in the management industry, another of the five industries with the highest employment levels, earn an average income of $57,720 annually. Those working in employment services aren’t far behind with an average annual income of $53,970. The average salary of a paralegal in the insurance carrier industry is $53,310 annually. And those in legal services, believe it or not, earn the least of the top five industries with an annual average income of $47,380. Salary is important, but a high salary is nothing without job security. By choosing a strong industry with a high employment level, you can make sure you enjoy a long career as a paralegal. Full-time paralegals earned an average of $49,640 as of May 2010, according to the Bureau of Labor Statistics. In addition to a salary, many paralegals are provided bonuses for the long work hours often required of them. Of the industries that employ the largest number of paralegals, the government’s Federal Executive Branch offered the highest median annual wages, $64,120. Top paying industries included petroleum and coal products manufacturing, software publishers, oil and gas extraction companies, computer and peripheral equipment manufacturing, and educational support services. As of May 2010, California was the state with the highest employment level of paralegals, employing 27,260 individuals and paying an annual mean wage of $59,790. New York ranked second, paying an annual mean wage of $56,920 to its 23,350 paralegals. The District of Columbia had the highest concentration of jobs, with 9.94 of every thousand jobs being that of a paralegal. According to the Bureau of Labor Statistics, the paralegal career is expected to grow much faster than average for all occupations, at a rate of about 28 percent between 2008 and 2018. Despite this, job competition is anticipated to be strong because many people are choosing to pursue this profession. Though private law firms represent the largest number of employers, many other organizations are hiring paralegals to do many of the duties formerly performed by lawyers. Individuals prepare to be paralegals in several ways. Forty-four percent of respondents to a survey conducted by job analysis site O*Net reported holding a bachelor’s degree. 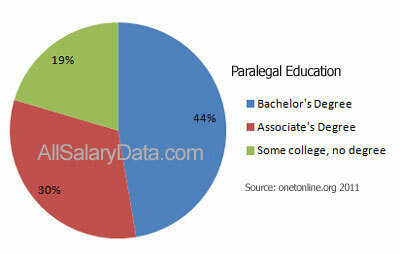 An associate’s degree paralegal program provided at a community college was the second most common level of education, held by 30 percent of respondents. Someone who already has a college degree can receive training through a certificate program in paralegal studies. An alternate method is to receive paralegal training on the job. An associate or bachelor degree program in paralegal studies usually combines training on the subject with courses on other topics. An associate degree program typically takes two years and a bachelor’s degree can be attained in four years. Certificate programs vary in length. Some take just a few months to complete because they focus on providing intensive training in the subject for those who already have a degree. The American Bar Association has approved approximately 260 of the over 1,000 formal paralegal educational programs available. Admission requirements vary by school and include a high school diploma, standardized test scores, personal interviews, legal experience, certain college courses, or a degree. Tuition costs vary by type of program and school and financial aid is often available. Some programs include internships in their tuition costs. Voluntary certifications are offered by various local and national paralegal organizations. An example is the two-day exam offered by the National Association of Legal Assistants (NALA) that qualifies individuals to use the Certified Paralegal (CP) or Certified Legal Assistant (CLA) credential. Various other occupations require a detailed understanding of the law without mandating the extensive training required to become a lawyer. One is that of a law clerk, who conducts research or prepares legal documents in assistance to judges or lawyers. Legal secretaries use legal documents, procedures, and terminology to prepare legal correspondence and papers and sometimes assist with legal research. Within the insurance industry, claims investigators, examiners, and adjusters handle the claims submitted by policyholders requesting payments. Title examiners, searchers, and abstractors examine titles, search real estate records, or summarize relevant insurance or legal information for different purposes. They are employed by real estate agencies, title insurance companies, or law firms. Paralegals in the District of Columbia are paid the most compared to any other state. They earn an average annual income of $61,660. Paralegals in New York City earn an average annual income of $57,910. In California, paralegals are also paid very well, with an average annual income of $56,400. It seems like the slogan for everything financial these days is “location, location, location.” Whether it’s real estate or job hunting, location is the most influential factor when it comes to maximizing your outcome. Careers are no different. In fact, you can greatly increase your salary just by choosing the best location to live and work. You would be surprised to learn the degree to which salaries in a single profession can vary! A paralegal’s salary is definitely a good example – you can see this simply by looking at salaries for this field in different parts of the country. Paralegals in the District of Columbia are paid the most compared to any other state. They earn an average annual income of $61,660. Paralegals in New York City earn an average annual income of $57,910. In California, paralegals are also paid very well, with an average annual income of $56,400. Believe it or not, Alaska is among the highest paying states for paralegals, with professionals earning $53,830 annually on average. Illinois is the fifth highest paying state for paralegals where they earn $52,330 annually. In a profession where some earn as little as $35,000 in some industries and regions, salaries in the highest paying states are staggering. However, it’s important to consider the cost of living when evaluating any salary for any profession. It’s no coincidence that many of the highest paying states are also the most costly states in which you can live. Also, remember that the average starting paralegal salary is often lower than what you will earn after you gain experience. The District of Columbia promises the highest salary at $61,660 on average. New York is second, with an average annual income of $57,910. Everybody wants to earn a great living. A good salary helps us take care of our families, plan for the future, and even feel good about ourselves. A high income can even boost confidence. But sometimes even the highest paying jobs won’t bring the kind of job security everyone is looking for. Knowing you can always find a job in your desired field is priceless, especially in difficult economic times. Certain states have more demand for various professionals and therefore have higher employment levels for those fields. In the paralegal profession, states with the highest salaries are not always the same states with the highest employment levels. But that doesn’t mean you can’t still earn a great income as a paralegal. The states with the highest employment levels for paralegals are the District of Columbia, New York, West Virginia, Connecticut, and Delaware. In terms of salary, these states are all across the board. The District of Columbia promises the highest salary at $61,660 on average. New York is second, with an average annual income of $57,910. Delaware promises average salaries around $51,020. In Connecticut, paralegals stand to earn an annual salary of $49,590. And in West Virginia, paralegals earn an average annual income of $36,620. The paralegal profession is always growing. But by living in an area that employs paralegals at a high rate, you can not only ensure a good salary but a solid future for your career and for your family. A legal assistant salary is highest n Stockton, California, where paralegals earn an annual average income of $65,890. San Francisco, California is a close second, where a paralegals’ annual salary averages $62,170. In San Jose, California, paralegals earn $61,920 annually on average. If you’re working as a paralegal, it is very likely that you are a savvy individual. After all, you chose a growing career that requires basic training and has tremendous earning potential. You have worked hard to get started in the field or you’re seriously thinking about it. But in order to get the most out of your paralegal career, you may need to take your research a step further in learning exactly where you can make the most money as a paralegal. Just as different states offer varying levels of income for paralegals from one to the next, the average salary of a paralegal can also differ from city to city. It’s important to know in which metropolitan areas you are most likely to earn the highest income as a paralegal. For example, a legal assistant salary is highest n Stockton, California, where paralegals earn an annual average income of $65,890. San Francisco, California is a close second, where a paralegals’ annual salary averages $62,170. In San Jose, California, paralegals earn $61,920 annually on average. High paying cities also exist in the eastern United States. In the New York City area, paralegals earn $60,670 annually on average. And in Washington, DC paralegals stand to earn $59,580 annually. New York City has one of the highest employment levels for paralegals as well as one of the highest paralegal average salary at $60,670. During difficult economic times like these, everyone is concerned about either finding a job or keeping their job. Everyone in the working world is aware of the hardships plaguing unemployment statistics. It seems like more people lose jobs every day even though things are supposed to be getting better. Believe it or not, some industries, occupations, and even geographic locations have managed to escape the downturn in the job market. Luckily, the paralegal profession is a line of work that has continued to see great numbers. These are great times to be a paralegal. But that doesn’t mean those in the field shouldn’t take extra measures to ensure their job security, including considering cities in the country where paralegals are in high demand. New York City has one of the highest employment levels for paralegals as well as one of the highest paralegal average salary at $60,670. The Washington D.C. area isn’t far behind, where paralegals stand to earn $59,580 annually. In Portland, Maine, paralegals are highly employed and can earn an average $44,540 annually. Jackson, Mississippi is also an area of high employment for paralegals where they can earn $39,010. And in Charleston, West Virginia, paralegals earn an average annual income of $37,300. Managing your career requires much more than increasing your income, especially when times are tough and jobs are scarce. Sometimes you have to go to the job to ensure you have the best opportunities available.